Habit: Annual. Stem: prostrate to erect, 0.3--3 dm. Leaf: blade < 6 cm, < 2 mm wide. 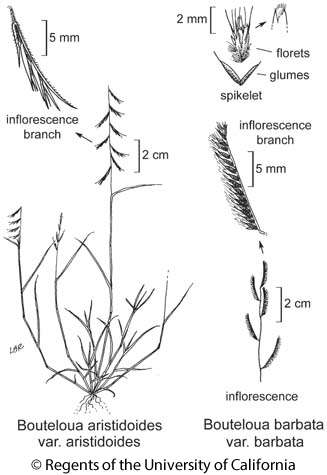 Inflorescence: branches 2--8, 6--25 mm, spreading to appressed, persistent in fruit; branch axis terminated by spikelet, base glabrous or puberulent; spikelets 7--40 per branch, spreading to ascending, breaking apart between glumes and lower floret. Spikelet: upper glume 1.5--3 mm, glabrous or puberulent, tip notched, awned from sinus < 1 mm; florets 2--3, lower floret lemma +- = upper glume, hairy below middle, tip 2-lobed, awns 0.5--3 mm, +- equal, central awn from sinus; base of middle or, if only 2 florets, upper floret hairy-tufted, lobed between awn bases, awns 1--3.5 mm, +- equal; uppermost floret (if present) < 1 mm, awn 0. Chromosomes: 2n=20,40. Ecology: Generally open, sandy to rocky slopes, flats, washes, roadsides, disturbed sites, scrub, woodland, pine forest; Elevation: < 1800 m. Bioregional Distribution: SnJV, e SCo, e PR, D; Distribution Outside California: to Montana, Kansas, southern Mexico, Argentina. Flowering Time: All year Note: Other varieties in Arizona, New Mexico, northern Mexico. Citation for this treatment: J. Travis Columbus 2012, Bouteloua barbata var. barbata, in Jepson Flora Project (eds.) Jepson eFlora, http://ucjeps.berkeley.edu/eflora/eflora_display.php?tid=71517, accessed on April 19, 2019. SnJV, e SCo, e PR, D; Markers link to CCH specimen records. Yellow markers indicate records that may provide evidence for eFlora range revision or may have georeferencing or identification issues. Purple markers indicate specimens collected from a garden, greenhouse, or other non-wild location.